Rumors are beginning to suggest Google's upcoming Pixel 2 and Pixel 2 XL may drop the 3.5mm headphone jack with new renders heavily suggest it won't feature on the new phones. 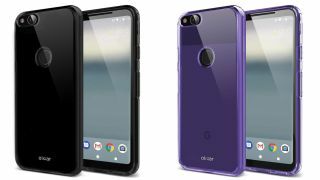 Case manufacturer Olixar shared renders via Mobile Fun show what the company expects the phone to look like and suggests the camera on the rear will be a large single sensor and the fingerprint sensor will remain on the back. The Pixel 2 renders are not confirmed designs for the phones though, so don't expect this to be the final look of the phone. That said, Olixar may have been given early information on the device to be able to create official cases ready for the release of the phone. A lot of big name accessory manufacturers are allowed to see early renders of products to be able to create cases ready for the launch of phones. If Google does decide to drop the headphone jack, it's currently uncertain why the company will make that move. It may be planning to make an ultra-thin handsets so needs to lose the legacy tech to slim it down, but the case renders above don't give us the exact measurements of the phone. The renders also picture a super tall screen with a small bezel with a similar look to the LG G6 and Samsung Galaxy S8 that launched earlier this year. It may mean Google is looking to an 18:5:9 ratio in order to be able to fit more screen on the device without increasing its size from the original Google Pixel. We expect to know all in the coming months as the release date is rumored for October or perhaps a little later in 2017.